LIKE NEW very Popular NICE model floor plan on an oversized corner home site w/Stylish single level architecture with a Spanish flair. 2BR + den w/cozy great room overlooking spacious island kitchen featuring upgraded maple cabinets and granite counters, a wonderful master suit w/large shower & dual sink vanities + large walk-in. An expanded dining room that leads to cozy & beautifully tiled covered enclave w/a gas fireplace. Enjoy the private rear yard with an expanded patio and built in BBQ. Upgrades incl. Surround sound w/speakers in & out, R/O sys, soft water, prof. landscaping & much more. 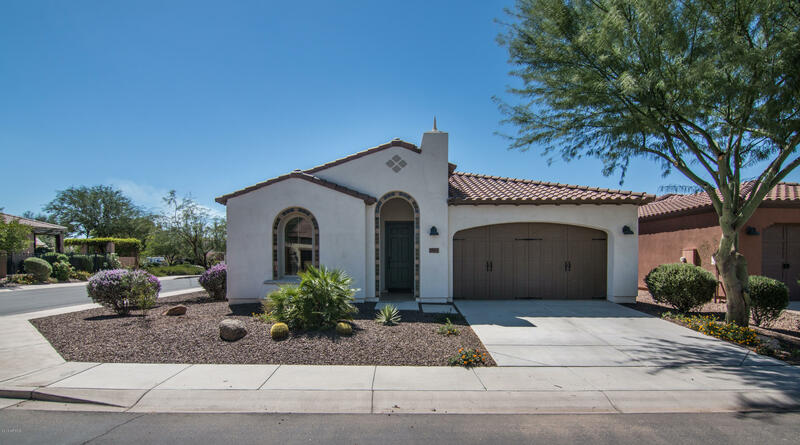 Enjoy Encanterra A Gated Private Country Club Golf Course community featuring a world class clubhouse, restaurants, spa, tennis courts, pickle ball courts, 4 pools, & more. This home is a must see!